There are countless products designed to give existing cars more modern features. Dash cams are fairly popular, like the Roav models we previously reviewed. There are also third-party tracking devices, like T-Mobile's SyncUP and Linxup. 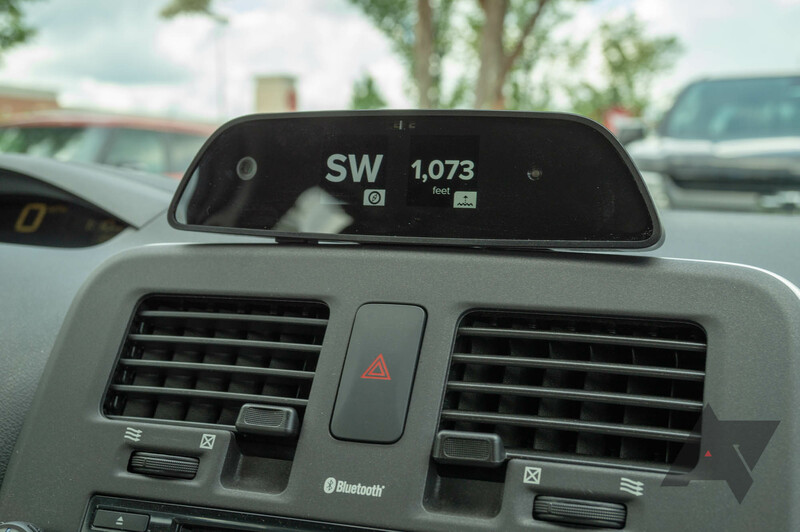 Dedicated navigation systems have largely been replaced by smartphones, but there are still plenty to choose from, like those from Garmin. 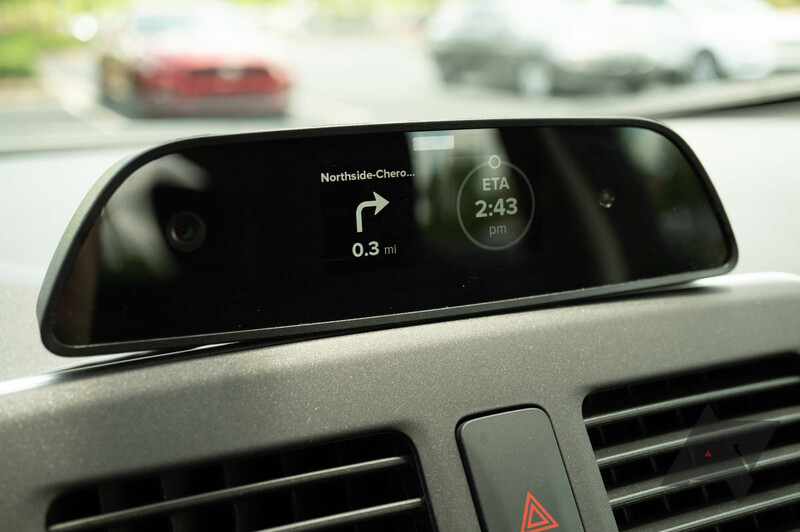 The 'Raven Connected Car System' aims to be all of those devices in a single package. While it does offer a great deal of functionality, there's one critical flaw that should concern any potential buyer. Design It's simple and unobtrusive. 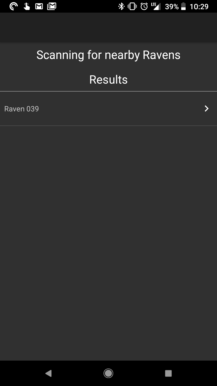 Mobile app The Raven mobile app is designed well and easy to navigate, which can't be said for many other IoT devices. Customizability It can display indicators for the current speed, remaining fuel, altitude, and more. Design (again) The internal fan is loud and makes a distinct buzzing noise. Damaged recordings Many of my video recordings were corrupted, making the Raven impossible to recommend as a dash cam. Compatibility Raven won't fully work with electric cars or most U.S. cars manufactured before 2008. There's not much to the Raven's design. It's a black plastic box, roughly in the shape of a rounded soundbar. There are two 320x320 LCD panels on the front, along with two cabin-facing cameras. 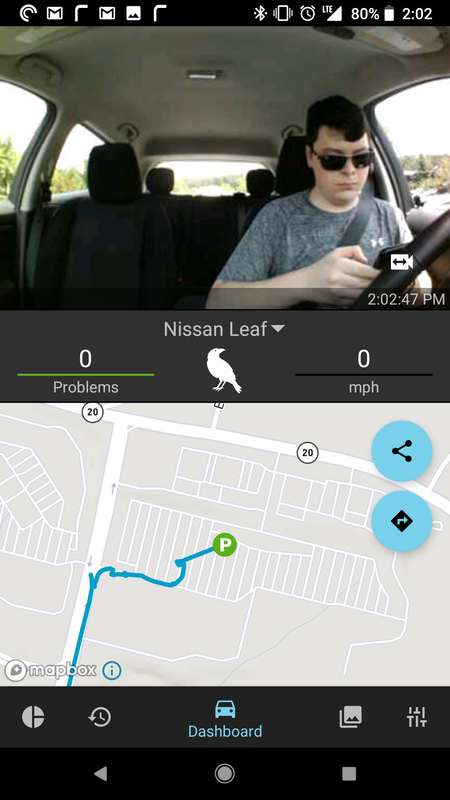 On the back is a road-facing camera, so the Raven can function as a dash cam. The unit is purely utilitarian - nothing flashy. The setup process is relatively simple, but lengthy. The included base sticks to your dashboard, or you can mount it upside-down on the front window. There's an additional adhesive pad included in the box, in case you want to move it later. From there, you just slide the Raven onto the base, and connect it to your car using the included data/power cable. The rest of the process takes place on your phone. Once you download and open the mobile app, you'll be prompted to make an account and pair with the Raven. Then you just have to wait for the unit's cellular connection to be provisioned, which took about 30 minutes in my case. There was one design flaw I noticed after a few days of usage, which became incredibly annoying as time went on. The Raven has a built-in fan to keep everything cool, which is understandable given how hot the interior of cars can become. Unfortunately, the Raven's fan is extremely noticeable. Not only does it make a constant buzzing sound, but the fan stays on almost all the time - even in cool weather. It's less noticeable if you're playing music or have the windows down, but it's a glaring flaw in the Raven's otherwise-decent hardware design. 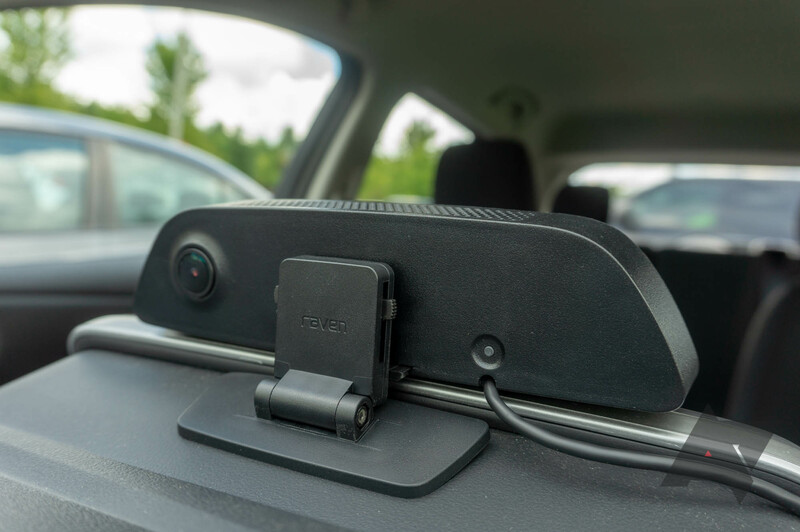 Like most other car diagnostic/tracking devices, Raven connects to your vehicle through the OBD II port. 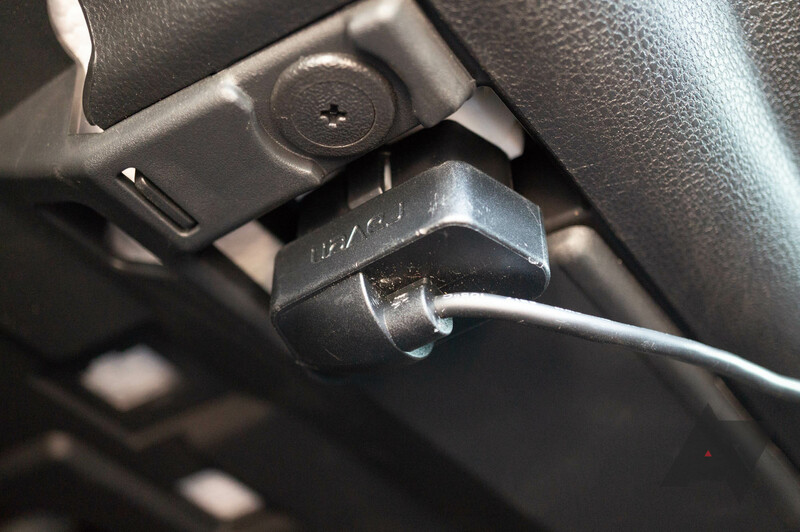 For those unfamiliar, almost every car manufactured in the past 20 years has this port, located somewhere around the dashboard (usually underneath the steering wheel). Raven uses the CAN protocol for some functionality, which didn't become mandatory in the United States until 2008 (or 2001 for European vehicles). There's a list of CAN-equipped cars here. In addition, Raven is only designed for use with gas and hybrid cars. 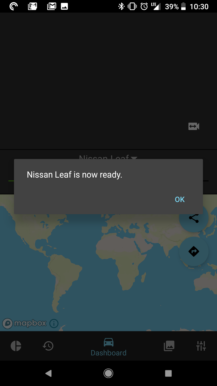 The MPH, acceleration, ambient temperature, and acceleration gauges on the Raven didn't work in my Leaf. They worked fine in the gas car. 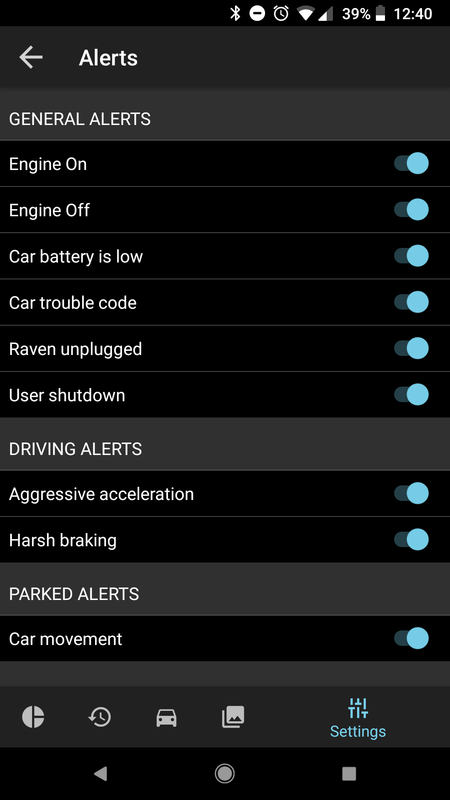 The Raven would randomly turn off while I was driving, thinking I had parked the car. Again, no problems in the gas car. I'm guessing electric cars send different signals over OBD/CAN than gas-powered vehicles, which the Raven can't read properly. Raven has five main functions. 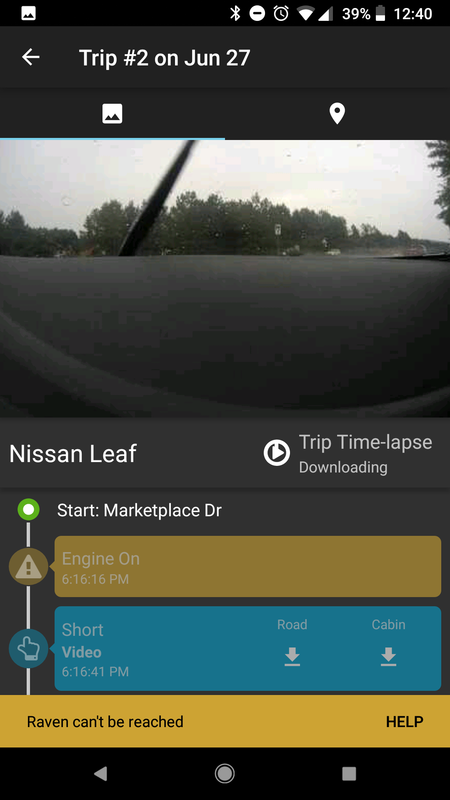 First, it's a 1080p dash cam that constantly records both the car interior and the road (you can also wave your hand in front of Raven to save highlight clips). Second, it's an always-on security system that will alert you if motion is detected when your car is parked. 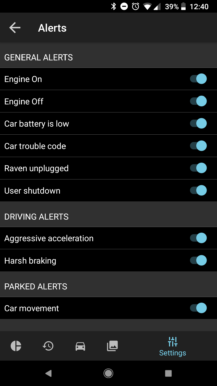 Third, it's a tracker with push notifications for certain actions (like hard accelerations). Fourth, it's a diagnostic device capable of reading OBD information. Finally, Raven works as a display for navigation instructions. That's quite a lot of functionality for one device, and Raven almost delivers. Camera footage looks decent, but it might be hard to position the Raven properly (unless you mounted it to your window). The security and mobile alert features work, but they're somewhat sensitive. 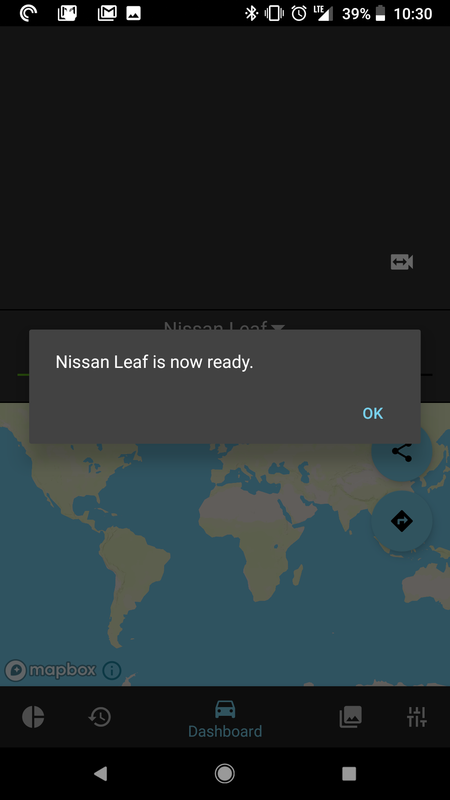 My car didn't break down during this review period, so I wasn't able to test the diagnostic feature. The navigation functionality was a bit of a letdown for me. As seen in the below photo, Raven can display navigation directions - but there are two catches. 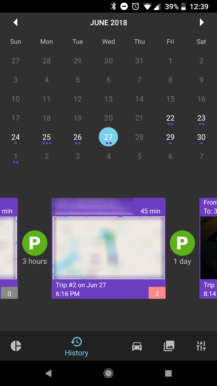 First, you have to start navigation from the Raven app, so no Google Maps (Raven is using Mapbox for this feature). 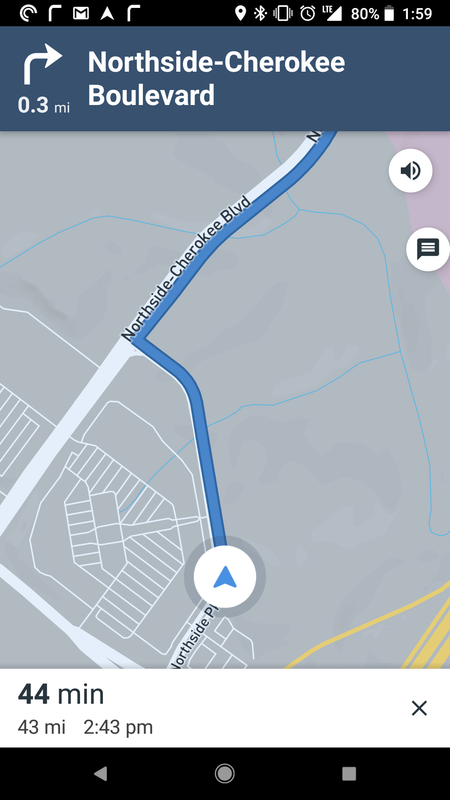 Second, if you turn off your phone's screen, the navigation immediately stops. The mobile app will be updated soon to fix that last issue, but that's something to keep in mind if you're buying a Raven now. Unfortunately, I found a major problem while uploading sample video footage for this review. A large number of video files on my Raven unit were incomplete or corrupted. That's definitely not great for a dash cam - imagine getting in a wreck and realizing your camera footage was inaccessible. Notice the blank or <5 MB video files - those are corrupted recordings. I thought perhaps the SanDisk microSD card that came with my Raven unit was faulty, so I switched it out with the Samsung Evo card I previously used in our Anker Roav C1/C2 review. After a few hours of driving, I checked the footage again, and there were five corrupted files out of 320 total recordings. 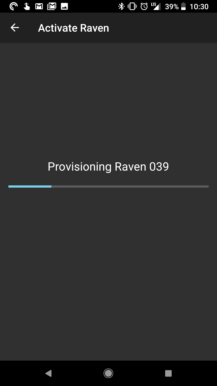 I know it's not an issue with the microSD cards, so my best guess is that there is something wrong with the Raven's software that causes it to save incomplete or corrupted recordings. It's possible that a factory reset would have solved this problem, but regardless, this is basic functionality that shouldn't be broken under any circumstance. 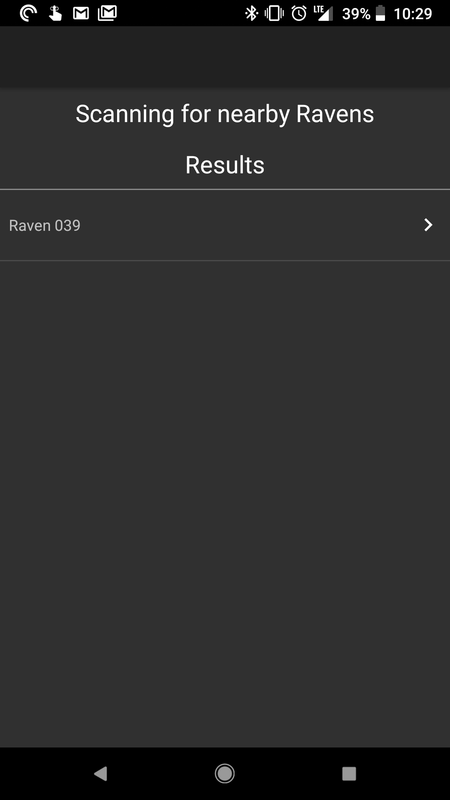 The Raven mobile app has five tabs. 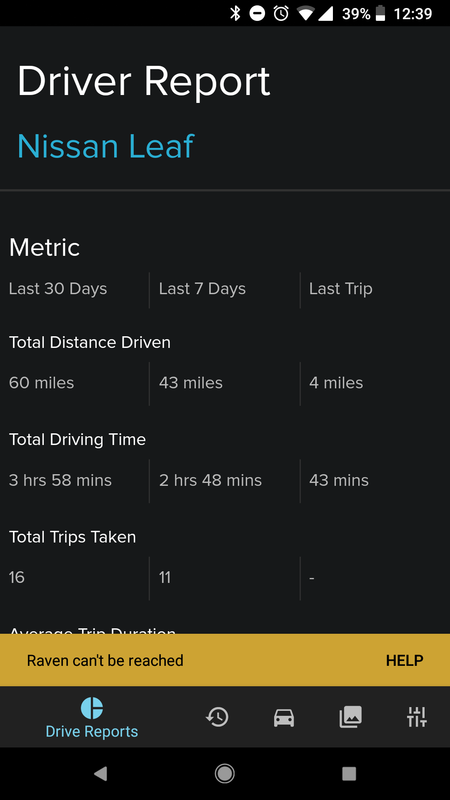 'Drive Reports' contains statistics about your vehicle, including distance traveled, average trip duration, average speed, and so on. 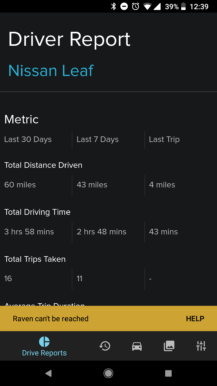 'History' allows you to view your recorded driving history, complete with a calendar for easy navigation and outlines of trips. 'Dashboard' shows a live feed at the top, and a map at the bottom. 'Media Manager' allows you to save recordings from the Raven, and the 'Settings' tab is where you can customize the unit's display and other options. 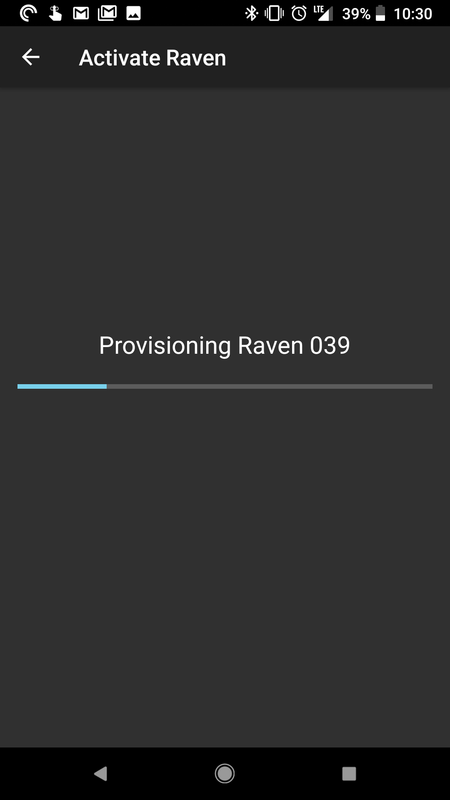 Most of the time, IoT devices like the Raven have terrible companion applications, especially on Android. That's not the case here - the design is simple and navigation is straightforward. I didn't experience any bugs, except that some video files would fail to transfer to my phone. As mentioned in the previous section, the original files were corrupted, so this isn't technically an issue with the app itself. The Raven has two 1080p cameras - one pointed at you and one pointed at the road. The interior cabin camera works just fine, but the exterior camera isn't great. Contrast is rough, and it's difficult to read license plates unless you're stopped. Another challenge with the exterior camera is positioning. If you mount the Raven on top of your dashboard, as opposed to sticking it on the front window, the view will probably be obscured by the car interior. 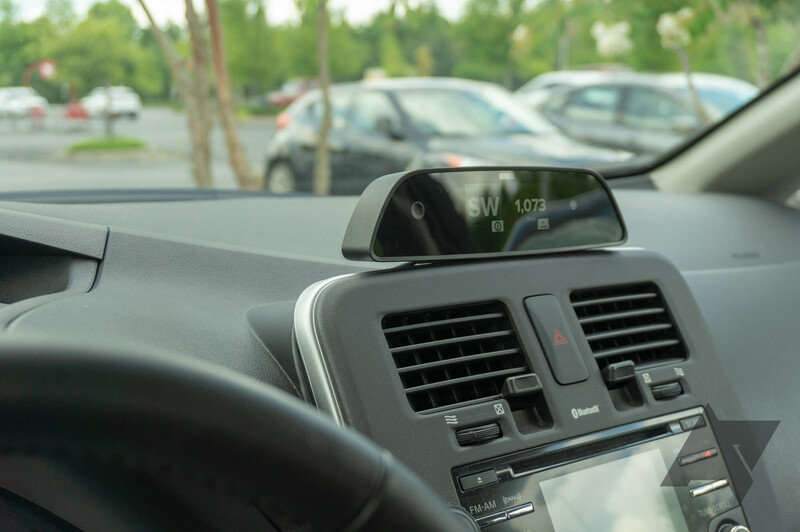 The Raven tries to be several products in one - a dash cam, car tracker, diagnostic tool, heads-up display, and more. Even with the buzzing fan and navigation limitations, the Raven probably would have been worth the $299.99 asking price for many people - especially parents. However, the persistent issue with corrupt recordings keeps me from recommending this product in its current form. To make matters worse, it's an issue that isn't apparent until you try to copy video files to your phone or PC, which is usually only done after you get into a car accident. Again, it's possible a factory reset of my unit would have fixed the problem, but there's no excuse for it to be happening at all. Perhaps future software updates will address this problem, but for now, you're better off buying dedicated dash cams and/or tracking devices.